The Friends decided to make the Chatham Street Chowdown a twofold event. We went to enjoy the fun and camaraderie of a food truck rodeo and to also take the opportunity to do a food truck review. 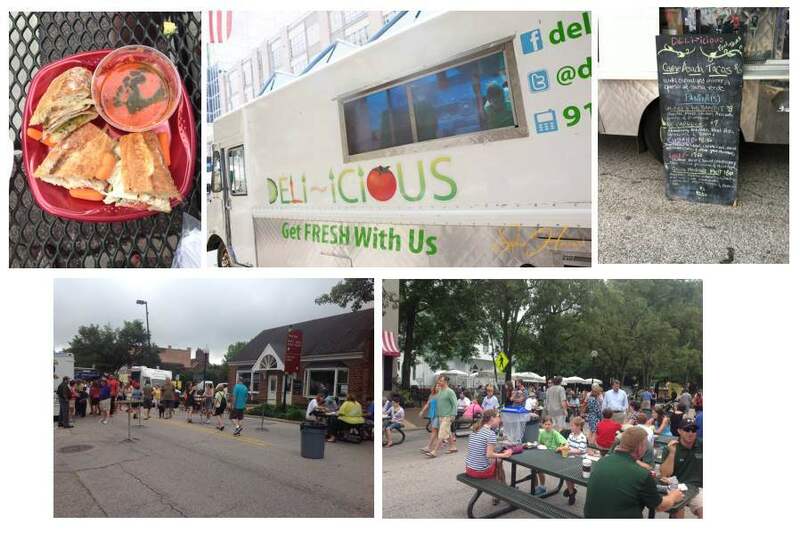 After reviewing the online menus (that were available) for the participating trucks, we decided on Deli-icious. Both the menu, which looked like it had something for everyone, (meat lover, vegetarian, and vegan) and the name, Deli-icious, a truck specializing in paninis seemed intriguing. They are not your standard turkey, ham, and roast beef on a baguette – this truck makes it interesting not only with their paninis but also with their “more yummys.” The Friends selected three paninis: Smokey and the Bandit, Cubano, and Lucky – along with one “yummy”: watermelon gazpacho. Each of the paninis came with a side of baby carrots. Baby carrots instead of chips are a novel idea – a crunch like chips but refreshing like a salad. The paninis were good size and the bread was just like I like it, crispy outside and soft inside. My favorite was the Lucky with slow roasted pulled chicken with provolone, apple and a spicy cranberry mayo. This panini was on point. The ingredients were fresh and complimented each other well. When I took a bite of the Cubano it did make me recall trips to South Florida and the Cuban sandwiches I had tasted there. The meat was moist and flavorful and neither the pickles nor mustard over powered it. The Cubano was a very nice blend of flavors. For me, Smokey and the Bandit was just average. The chicken in this panini came across on the dry side and I would say overall it was kind of bland. I expected more kick from the chipotle mayo. As far as any gazpacho goes, I can take it or leave it. The watermelon gazpacho was cool and light but I felt it needed more watermelon flavor. During the Chowdown at the Cary Food Truck Rodeo, I had the opportunity to sample selections from the Deli-icious Food Truck. My sandwich was the sandwich called Smokey and the Bandit. The roll was good, and did not get soggy from the sandwich ingredients. The chicken was slightly over-cooked, needing a dressing of some type to add moisture to the sandwich. The avocado was green and the tomatoes were flavorful, but could have used some salt and pepper. The sandwich had an ample amount of meat and filling. I thoroughly enjoyed the Cubano sandwich. The pork was cooked to perfection and was tender and moist. The mustard and the dill pickles were good and did not overpower the overall flavor of the sandwich. I would purchase this again. The Lucky sandwich was okay, but the chicken was not as dry due to the cranberry mayonnaise. Once again the bun was full bodied and great for a sandwich. It was good, but I am not a big chicken eater, and prefer beef and pork over chicken. The watermelon gazpacho had a good flavor. I could taste, or at least I thought I tasted garlic, tomato, olive oil, cilantro and of course watermelon. This gazpacho was more savory, than what I make myself, and could have used some salt. I really am not a heavy salt user, but a small amount makes everything taste better. Paninis are a popular sandwich style that can incorporate any small bread loafs, as well as an array of middle-matter. There are, of course those who would argue that the true “Panini” is pressed by a grill, but that is more a distinct variation. Deli-icious uses a baguette, and a very hearty one at that. Add to that hearty portions of chicken, pork and roast beef, and then finished off with fresh traditional toppings and cheese. The Deli-licious Panini is a mealtime must. My next favorite was the Smokey and the Bandit. A hearty portion of roasted chicken breast, avocado and provolone cheese. I found the chicken a little on the dry side, but found that the ripe avocado made up for it with tender enhancement to both flavor and texture. The Lucky, wasn’t so much – at lest for me. As above, a hearty portion of roasted chicken was left dry, with very little to give it any zeal. I have never had Watermelon Gazpacho, but I do enjoy the summer fruit almost everyday when in season. It was tangy, as well as smooth. The flavor was unexpected, and delightful, though admittedly, I’m not Mr. Gazpacho, I felt the sweet and smooth watermelon provided a tangy tone down, a refreshing departure from regular Gazpacho. I liked the Cubano sandwich, minus the pickles the best. I left the bread, devoured the pork. I like my Mom, the Traveler do not eat chicken, so I chose to ignore both of the chicken sandwiches. Maybe if you added cheese, I would have sampled it. I do not like watermelon, so I walked away from the gazpacho. I do like ice cream, but it was too hot for the ice cream to make it home from the rodeo. Maybe next time Mom can buy some especially for me. I eat anything. I loved it all. When mom is eating, she has to fight me off from her plate, when she is sitting on the couch watching TV. I am always hungry and can’t seem to get full, because I am bouncy like my idol Tigger. Mom tells me I am like an old commercial about Life Cereal. Instead of Mikey, she says give it to Jack, he will eat anything. Mom is going to take some pictures of me, Bob too so everyone can see how I am growing.